After writing my Got Milk? post, I went to the grocery store on a mission to buy produce that was specifically rich in calcium. It is great that I am eating all the right foods so that my body can heal as best as it can, but I wanted to try and do an even better job of making calcium more bio-available to my body in case it needed it. I know that cooked dark greens are great calcium-rich choices. I’ve always loved kale, but thought that straying from the usual and giving it more variety could do my body good. 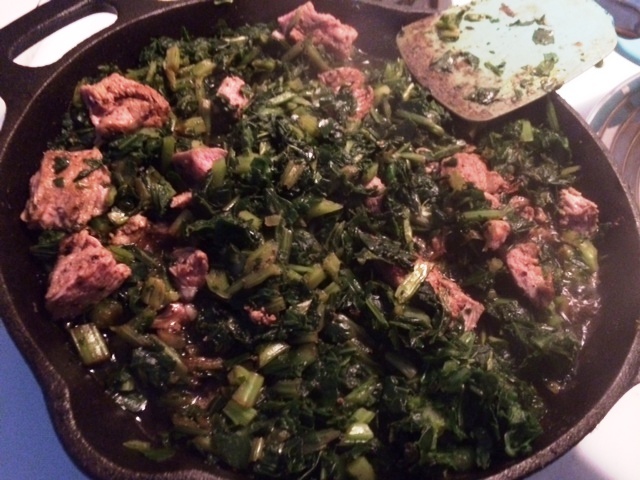 So I went back to my Southern roots: collards and turnip greens. Just one cup of cooked collard greens has 220 milligrams of calcium. 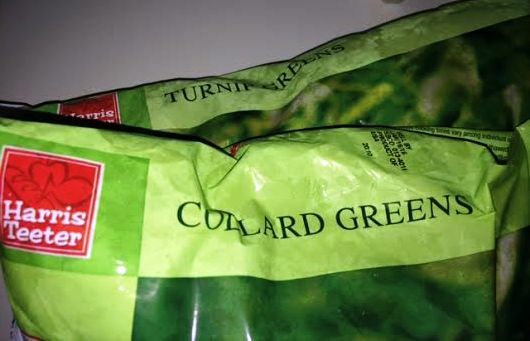 Turnip greens have 99 milligrams of calcium per cup when cooked. Adding these rich greens into my meals along with my everyday cooked kale which has 93 milligrams of calcium per cup isn’t bad at all! I found these calcium milligram measurements on Eat Drink Paleo. I also picked up some broccoli and okra which also made the calcium-rich list. 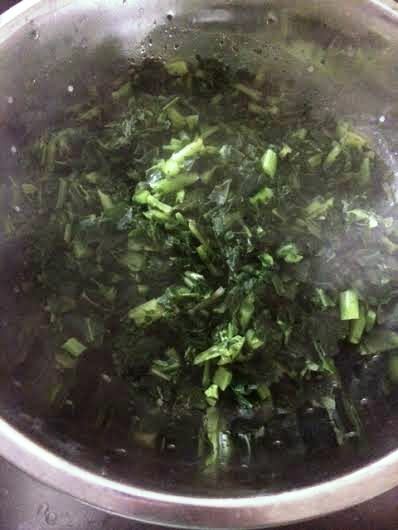 For dinner last night, I boiled a pot of water and added the greens in it. I opted for the frozen bags because not only were they cheaper, but they are super splint-friendly in the kitchen. 😉 No chopping required, which means no ambidextrous skills needed from me! I let the greens simmer in the hot water for about 10 minutes and then drained them. While my greens were draining, I browned some veal that Hubs had put in the freezer a few weeks ago. I’ve never had veal. It was so juicy and tender; plus it smelled so good while browning on the cast iron. 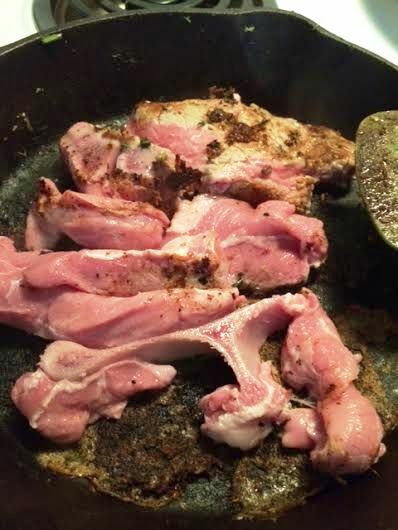 I removed the veal after it browned and cut them into slices. I then added the greens to the skillet and poured a cup or two of my home made bone broth in for the greens to simmer in. I also like to think that the nutrient dense bone broth enhanced my dinner to give me super healing powers. 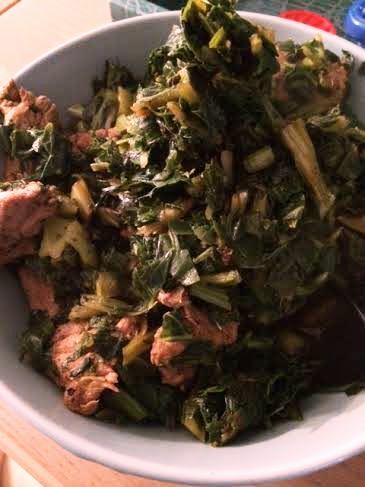 I then added the slices of veal back into the broth-simmering greens and covered it up for just a couple of minutes. Then dinner was served! I think pork would have been a perfect pairing with the cooked greens, but we didn’t have any in the house at the time. The veal was pretty damn good too! I have my second follow up appointment with the orthopedic specialist tomorrow morning and I don’t think I have ever been this excited to go to the doctor’s! I am really hoping I can get my splint off after tomorrow. That would mean it would come off a week earlier than the doctor said, but I am very optimistic about my recovery and from what my body is telling me, I am feeling great! Fingers crossed!